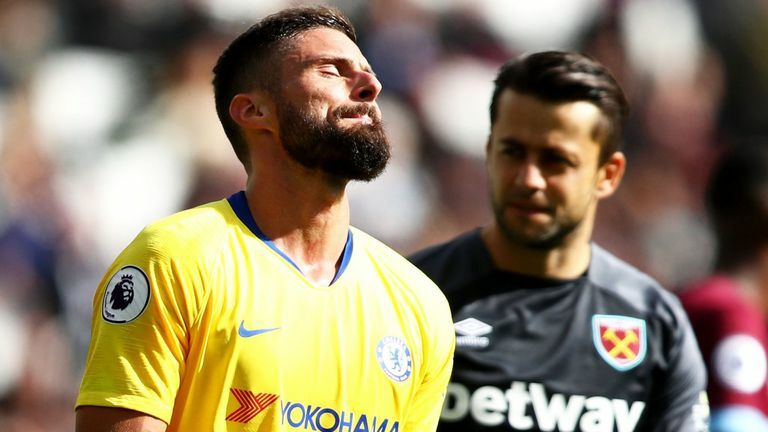 Jorginho set a Premier League record for passes on Sunday but he and his Chelsea team-mates couldn't find a way through a resolute, well-organised West Ham and dropped their first Premier League points of the season in the process. The Italian midfielder, who Blues boss Maurizio Sarri brought with him from Napoli this summer, has dictated the west London club's play this season and made an incredible 180 passes at the London Stadium. That's the most ever recorded by Opta, who began collecting detailed passing data in 2003/04, surpassing Ilkay Gundogan's metronomic display at home to Chelsea in March (174 passes) and Jorginho's own 173-pass tally against Newcastle earlier this season. It's a remarkable total but illustrates just how much probing Chelsea had to do with their 71 per cent of possession as they tried - but ultimately failed - to pick their way through the home side's defence. They came close. Very close. Only the head of Hammers goalkeeper Lukasz Fabianski kept out Alvaro Morata's close-range chip, while Willian volleyed Jorginho's lobbed through ball wildly wide from inside the six-yard box late on as the visitors pressed for a sixth straight Premier League win. Yet, despite those passing stats and the gilt-edged chances for Morata and Willian, for all of Chelsea's attacking play they will feel disappointed not to have performed better in the key moments in the final third. In all, they managed just three shots on target in each half. "Chelsea have just been a little impatient and the quality of their passing hasn't been good enough," said Gary Neville on commentary. "You can see how many West Ham players are in front of you. It's impossible to get through so you just have to take your time." In the Sky Sports studio, Jamie Carragher agreed, and was surprised playmaker Cesc Fabregas remained an unused substitute while attacking midfielder Ross Barkley was only thrown on with 11 minutes to play. Both players could have aided Jorginho. "They didn't create enough," he said. "The disappointing thing for me from Chelsea were the changes, especially in the midfield area. "They should have come a lot earlier. I can't believe we never saw Fabregas. Barkley came on in the 79th minute when it should have been 20 minutes before that." Both Barkley and Fabregas featured in Chelsea's Thursday night Europa League win away to PAOK Salonika and, along with the rest of the squad, were held up by the delayed flight which meant the team didn't return to England until Friday afternoon. But it was a determined West Ham defence, rather than fatigue, which caused them problems in this London derby. Hammers boss Manuel Pellegrini has endured a tough start in the East End, losing his first four league games in charge before a morale-boosting win at Everton. And he and his players built on that result with a well-executed performance against Chelsea. We allowed them to have the ball in the zone where we wanted them to have it but near our box we defended well. "I think we played a good tactical game," he told Sky Sports. "We allowed them to have the ball in the zone where we wanted them to have it but near our box we defended well and we kept our first clean sheet. "We allowed them to try to attack more from the right side than the left side, where they're very dangerous with Marcos Alonso and Eden Hazard. We forced them to play from the other side. "We were very concentrated, our organisation in every moment we did very well." The stats support Pellegrini's view, with 43 per cent of Chelsea's attacks on the right flank compared to 25 per cent on the left, and West Ham's 45 clearances - the second most made by any Premier League team this season - illustrating their tireless defensive work. Chelsea will have far less of the ball when they face back-to-back matches with Liverpool in the Carabao Cup and Premier League over the coming week. Record-breaker Jorginho and his team-mates will have to be far more precise in the final third.